When you want to keep your business safe, a checklist always helps. Let’s take a look at that checklist: security cameras, locks, security personnel, and employee vigilance. You also encourage guests, visitors, and customers to do whatever they can to ensure your business remains a safe place for everyone. That’s why it’s important to have fire alarms all over your building, particularly in areas you otherwise wouldn’t think they would need to be. You also encourage guests, visitors, and customers to do whatever they can to ensure your business remains a safe place for everyone. That’s why it’s important to have fire alarms all over your building, particularly in areas you otherwise wouldn’t think they would need to be. If your building has outdated alarms systems, then you need to get them installed. In some cases, however, you might be moving from your current location to a new one. The new site could be a new construction building that hasn’t been equipped with fire alarms yet. Either way, you will need to have fire protection professionals handle it for you. This isn’t a job for building owners or property managers to do by themselves. That way, you can make sure that the alarms are where they need to be. You can also ensure compliance with all fire codes, no matter where your building is located. Every business is different, so you will likely need different fire protection measures. Early detection is a crucial part of ensuring fire protection. When the fire alarms go off, everyone in the building knows it is time to evacuate. The sooner the alarms go off, the more time the building occupants have to get out safely. This can also reduce the amount of property damage, injury, and even fatalities that can affect your business. Older buildings are more likely to be not up to code, and this means that fires can spread more quickly through them. Fires and other emergencies also don’t always conveniently wait to happen during business hours. The fire alarms can monitor for problems that happen during weekends and other times when your business isn’t open. The best fire alarms will continue to operate no matter what environmental issues they encounter. However, they need to be inspected and maintained regularly. This ensures that they keep working when needed and won’t fail the next time a fire breaks out. 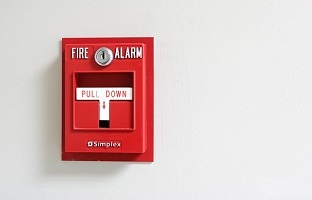 Even if a fire has never occurred in your building, it is still a good idea to install modernized fire alarms on every floor and in every room. This entry was posted on Thursday, April 4th, 2019 at 9:22 am. Both comments and pings are currently closed.